Last year it was Leeds. This year it’s Edinburgh! 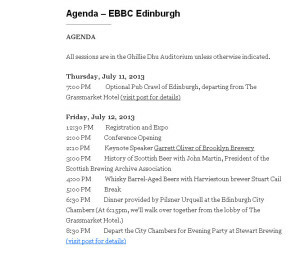 The European Beer Bloggers conference, of course! I can’t wait – and although I’m only going for one day (tomorrow/Friday), I know it’s gonna be ace. Ace because I will get to see and catch up with some of the wonderful bloggers from across the UK I met last year, snog old friends and track down some new friends to snog: all in the name of beer. I’m not sure if I’ll be live blogging on the Friday, I’ve only just glanced at the itinerary but it’s an opportunity for like-minded individuals to come together, talk, learn and sup. The learning part is great, and – to me – incredibly important. Learning about new beers from breweries I l already know and love, and hearing from people I’ve never met is all part of being a beer lover and developing my skills as a Beer Sommelier. It means I can communicate those experiences to you, my lovely readers!! So you can see what I’m up to on the #ebbc13 hashtag on Twitter. I’ll post a video of various afternoon shenanigans at some stage too, no doubt. And may the sun continue to shine heavily on the gorgeous city of Edinburgh. 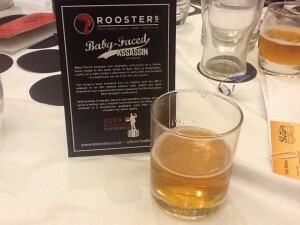 This was my beer of the festival last year – Rooster’s Baby-Faced Assassin IPA – a limited edition beer of epic proportions. Read all about it here on my blog post from last year’s EBBC. Last time I was in Edinburgh back in April, I zoomed up by invitation from Innis and Gunn for the launch of their new lager, however I also dropped in on some of the stunning city’s wonderful bars. 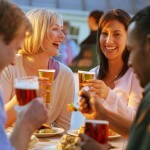 Which I’m sure those on the pre-Conference pub crawl will be indulging in right NOW! The Hanging Bat and The Bow Bar were cracking places with a very impressive array of beers! I thought I’d died and gone to heaven supping Stewart Brewing beers in the Bow! Awesome. I will aim to get back to these places again before the day is out. Check out my photos of both places on Facebook! * A: How about a b-gloggle?? Utterly jealous of your weekend! 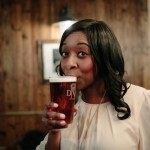 Also, surely it has to be a Round of Beer Bloggers? Given beer bloggers ability to get quite carried away with their praise, I reckon the collective noun would have to be a ‘froth’ of beer bloggers.